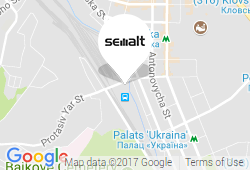 Semalt FULL SEO helps to take your website to TOP 10 on Google search results and to increase the amount of target traffic. If you wish to maximize SEO results we suggest you upgrade to full SEO plan. Full SEO presupposes not only external optimization but internal as well. Our engineers will be working on fixing site errors, SEO texts writing and compliance of your site with SEO requirements. Together with full SEO you'll be able to reach top positions for your keywords in a short period of time. The FULL SEO package includes the maximal number of options required for search engine optimization. It allows to increase the website visibility within a short time using only whitehat methods. You can choose the required parameters of the FULL SEO package for your project. You set the limit for each option. Create your own tariff plan on the spot. Open the page Semalt Pricing and open the tab FULL SEO. Select the limit for each offered service. The final price of the FULL SEO package depends on the selected options and their limits. Once you select the required parameters, click the button Subscribe to proceed with the payment. Below you will see the chosen features and the list with options included to the packages. 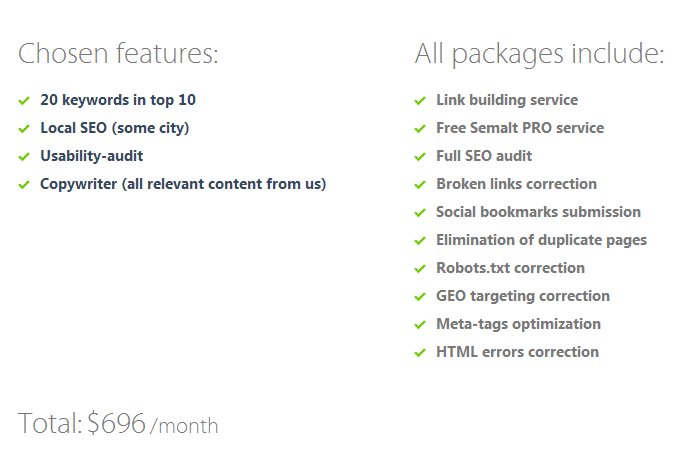 Here you can see the final price of your individual FULL SEO package. FULL SEO is the best complex of tools you can use to achieve fast results and increase your website profitability.